Did you know that burnout has many layers? It is about much more than physical exhaustion or illness. Sure, when experiencing nurse burnout, you may feel tired. You may even get sick. But did you know that it is about so much more than stress or physical pain? And that because of this, you may need extreme burnout recovery strategies? Burnout is a multi-faceted problem. It affects the whole person. In addition to physical sickness, it can cause emotional stress, mental exhaustion, and even spiritual issues. Christina Maslach and colleagues were asked to study employee engagement. Instead, they found burnout! And continued to research employee burnout, creating the Maslach Burnout Inventory. The Maslach Burnout Inventory has three sub-scales: emotional exhaustion, depersonalization, and a diminished sense of personal accomplishment. Discovering this can help us understand why, as nurses, we experience burnout on a more than physical level. Since burnout is additionally related to emotions, how we feel about our career and accomplishments, and how we relate to patients- we can agree that burnout can affect us on many levels. As a holistic nurse, I like to look at things from many angles. I think that is one of the many reasons why I love the Maslach scale. It explains why a nurse who is extremely fit, eats well, and sleeps through the night still might experience nurse burnout. No matter how good we take care of ourselves in one realm (in the prior example- the physical well-being), we can still be affected by burnout if we are not careful. Using the Maslach Burnout Inventory as a reference, we are now going to go through three burnout recovery strategies you can use to prevent and/or stop nurse burnout in your nursing career. 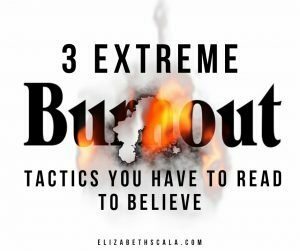 Here are 3 extreme burnout recovery strategies you have to read to believe. As nurses, we give. And give. Give. And give some more. We are constantly caring for other people. We experience death, trauma, and pain. Our patients come to us, often times, at their worst. We need to put on a happy face, care for them, hope that they become well, and then teach them ways to stay healthy. It is hard work. Tiring work. Giving of oneself in this way can become exhausting. In order to prevent and/or stop burnout in its tracks we need a plan. Something to fill up our cups. Emotional and mental cups, that is. In this case, I would like to recommend reconnecting with loved ones outside of work. Who do you owe a phone call to? When can you sit down with a friend and just have coffee? Why not take your spouse, partner, or loved one out on a date night? Fill up your relationship tank so that you experience joy outside of the workplace. This will help you when nursing can become emotionally exhausting, as we all know it will. This is the whole reason I started The Art of Nursing Nurse’s Week program in the first place. Years ago, I was hearing from nurses all over the country about the fact that they had no time to BE with their patient. The electronic record and all of the technological bells and whistles of healthcare changed our workflow. It is much harder for a nurse today to sit down and connect with the patient. So, to prevent and/or stop nurse burnout we need to take the time to connect with the patient in front of us, even if only for a second. What I recommend here is very simple. A pause, deep breath in and out of your nose. Feel your feet on the floor. And then go into see your patient. You can do this as you wash your hands. You can do this as you chart. You can do this all throughout your day. And here’s a bonus tip… you can do this WITH your patient too! This will increase the connection between the two of you and leave you feeling much more satisfied with your work. Guess what- no one is going to recognize you for your work as well as you can. Sure, we can receive a certificate for an accomplishment. Our supervisor or manager may come to us and thank us for a job well done. We may even win a nursing award during Nurse’s Week for a poster or presentation. And as good as those public showings of recognition feel, that sense of accomplishment HAS to come from within first and foremost. So- what can we do with regards to this burnout sub-scale? Here is a really fun one! Take it in. So, if a patient says, “Thank you” instead of rushing out of the room to go give your next medication, stop. Pause and breathe. And look at them, saying “You are welcome.” Also, if you have a really great day, with a positive patient encounter like that… go home and journal about it. Write down the experience and how it made you feel. Then tuck these away in a box or notebook. Each year, set aside a special time (I recommend your anniversary of becoming a nurse, since we all remember that date on the calendar!) and take out the box of handwritten positive patient encounters. Read them to yourself and relish that feeling of pride and accomplishment. No one will have to know that you are doing it so you do not have to feel guilty for tooting your own horn. Do this and feel just how great of a nurse you are! What would you add to this list of burnout recovery strategies? Taking a holistic approach, what physical, mental, emotional, energetic, financial, or spiritual tip can you share with the readers that will help them combat nurse burnout? Share below and thanks for reading! I really like the suggestion on pausing and breathing in the appreciation/thank you we receive from a patient. That is one I plan to do. What helps me to prevent burnout is to have a morning and night time ritual. My morning ritual is called 33LN, which I will not go into detail about. But one of the things I do is set an intention on how I want to FEEL and BE for the day. By doing this, especially prior to when I work in the hospital, it helps me to BE and FEEL more grounded and at peace and overall less overwhelmed and stressed while at work. At night I reflect the things went well and say a gratitude prayer. BTW I really like the graphic on this blog post. Thanks, Cassandra! Appreciate the additional tips and thank you very much for the feedback. I like some points in the data of nursing weeks, wishing all the best to the medical staff, in proof data the Depersonalization is the most interesting part. Elizabeth, this information is very helpful and valuable to me. Thank you for sharing your expertise and resources to enhance our personal well being and nursing careers. You are so welcome. Thanks for the feedback! Nice additional tip, Barbara. Thanks for sharing. Great to hear you’ll be using some of what we’ve mentioned!! excellent article and one I hope many nurses and other healthcare professionals will read. we are part of a caring profession and you help all to remember to take care of themselves. Good work Elizabeth! 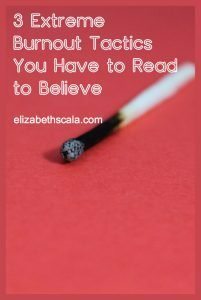 Excellent article Elizabeth. You help us all who are part of a caring profession to remember we have to also care for ourselves. Thank you for your work.